Explosive grenades are one of the oldest types of gunpowder weapon, and one of the most dangerous to use. Grenades are a simple cast iron ball, with a fuse sticking out of the top. Fuses are notoriously unreliable, and grenadiers can die as their own bombs explode prematurely. Yet no matter how terrifying grenades are for the throwers, they are infinitely worse for the targets! Grenadiers see themselves as elite, and occupy the place of honour at the right of the line on parade. They have good reason: only large, brave men become grenadiers, because it takes a big chap to throw one properly. Even their uniform makes them look bigger thanks to the pointed grenadier’s cap; a tricorne gets in the way of a good throw. Historically, grenadier regiments and battalions began as ad hoc assault forces. 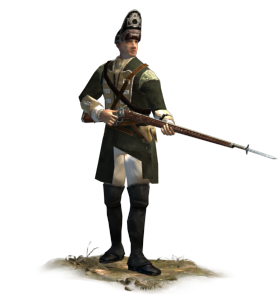 All line infantry regiments had grenadier companies; collecting these sub-units gave commanders a useful group of heavily armed, aggressive and skilful soldiers. Grenadier companies remained in line infantry regiments after the creation of grenadier regiments, but they abandoned grenades. Instead, each grenadier company became a “heavy mob” of the biggest and strongest soldiers in a regiment.